Mia Fiona Kut is an actress, filmmaker, and business owner born in the rural suburb of Richmond, BC. Ever since her role as ‘The Deranged Man’ in a 2nd grade play in which she also wrote, her passion for storytelling has fuelled her versatile abilities in acting and filmmaking. Mia pursued film after completing her degree at Simon Fraser University. Focussing on directing and screenwriting, her first web series, 'Ivy Tower', landed a spot at the Los Angeles Web Fest, and her short film 'Wildhouse', won the 'Special Jury Award' at the North American Film Awards, the 'Award of Excellence' at Canada Shorts, and spots at Canadian Diversity Film Festival and 2nd Asia International Youth Exhibition. Her latest short film 'Sonder' has recently been submitted to film festivals, and has already won ‘Best Female Fimmaker’ at the Los Angeles Independent Film Festival Awards. She was also chosen as one of the Top 30 Under 30 Youth for the Richmond Review newspaper and featured on the cover page. She is the Face of Diversity in the Asians in Movies worldwide campaign. Two of her sci-fi feature films have placed as a Runner Up in Telefilm Canada/Telus/Women in Film's genre screenplay competition, with a jury consisting of writers from Van Helsing, Continuum, and Nightmare on Elm Street. As an actress, she has recently appeared on CW's 'The Flash', FOX's 'Wayward Pines' and 'Minority Report', DirecTV's 'Rogue', horror feature film 'Poignant' opening at the Rio Grind Film Festival, and arthouse feature 'Floating Away' in which she was awarded at the Los Angeles International Film Festival as part of 'Best Ensemble Cast'. She is also the founder of the all-natural, vegan skincare brand Luna Nectar, in which the products are available in stores internationally. I’m an ideas person; creating the vision and handling execution is what I do best. Also I’d say I’m a connector of people – whether bringing people from all different walks of life for a common cause or project, or a fun gathering! I never take no for an answer, and I don’t let excuses or lack of enthusiasm dull my energy. People think I’m crazy, a daydreamer, or going way too big sometimes, but I know it can be done – it just takes careful research, preparation, and execution. To hopefully inspire someone else to live their best life. I want to mainly be happy and live freely with no expectations of societal norms. I would also really love to live in a mandala house in the forest with a creek running through it. I’m very proud of creating my skincare brand, Luna Nectar, from the ground up. We specialize in an all-natural, PETA-certified vegan, and cruelty-free lash and brow enhancing serum, and we are in stores internationally. I’m also proud of my latest short film, Sonder, that I wrote, directed, edited, and starred in. Recently I won ‘Best Female Filmmaker’ at the Los Angeles International Film Festival Awards. I’m always so critical of my work, so I’m happy that people are enjoying a little piece of my truth that I have birthed! I’d say most of all, I’m very proud of being able to pursue both of my passions simultaneously! It never feels like I am working. The past 1.5 years have been the most difficult for me personally. I’ve gone through many dark, traumatic, emotional events that have truly tested my resilience and sanity. Thankfully, in the process, I have learned to embrace vulnerability and self-acceptance, honour my well-being, and choose my relationships wisely. I love Tatiana Maslany, such an amazing, versatile actor and grounded, humble individual. I love London and Japan, and I feel like my favourite destination has yet to reveal itself. I need to do more travelling. 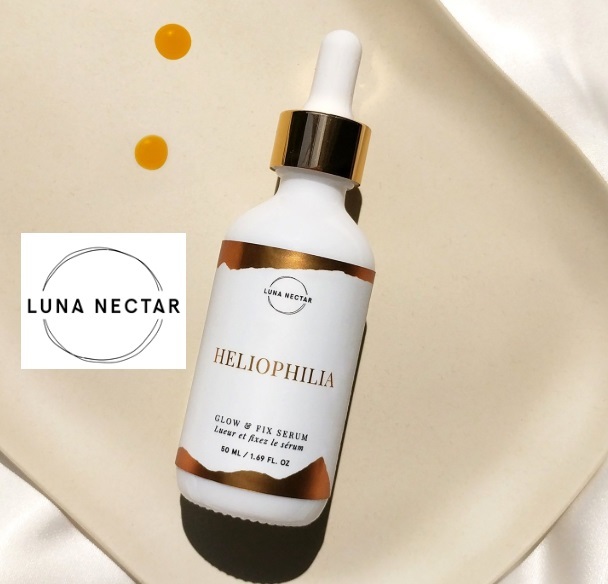 I will put in a plug here for my brand Luna Nectar’s Heliophilia Glow and Fix Serum! It’s a multi-purpose skin and hair serum for skin and hair concerns, as well as a beard/after shave oil for men. Hiking. I go hiking almost every weekend, and I plan on doing the 6-day West Coast Trail. Of course I have to train for it, as it is pretty intense with rugged trails, and apparently some swimming and caving in the backcountry. Next summer, hopefully!